The Writers Bloc Presents: Getting Your (Writing) Groove Back! Write every day! With an outline! Or maybe some index cards? Unless you're a pantser, that is. Or staring down the barrel of a half-finished NaNo draft and wondering what made any of this sound like a good idea in the first place. Is it too late to start over? Help! If you're awash in a sea of writing advice and still struggling to find your rhythm, never fear: Kathleen Baldwin and Patience Griffin are here for you. These two bestselling authors discuss several writing processes in a lively, interactive conversation aimed at helping you find the process that helps you to write at your optimal speed - and step away from the keyboard feeling fabulous. 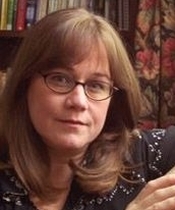 Patience Griffin is a bestselling author of women’s fiction. The first book in her Kilts and Quilts series, To Scotland with Love, received a Publishers Weekly starred reviewed, won the New England Readers’ Choice award, and a Golden Quill for best first book, It was also was a double finalist for the coveted RITA® award. Griffin loves to write about home, heart, and community. These two writers are friends, but they use distinctly different methodologies. Hang out with them on Sunday, November 12th at Interabang Books from 5 to 7PM. Join in for a light-hearted debate about what works, what doesn’t, and why. It’s bound to be enlightening, and you just might discover a new technique that boosts your process to the next level!